MANHATTAN — Manhattan Borough President Scott Stringer will suggest building beaches along the East River and constructing a giant wall around the ConEd transformer that exploded during Hurricane Sandy during his final State of the Borough Speech Thursday night. Stringer, who recently dropped his bid for mayor to run for Comptroller, is planning the developments as part of a larger “East River Blueway Plan” designed to improve access to the East River from the Brooklyn Bridge to East 38th Street, with new bridges, wetlands and green spaces. The plan also includes new fortifications to better protect the area from future storms. During Sandy, the East River flooded all the way to Avenue B and First Avenue, turning the FDR Drive into a riverbed and blowing the ConEd transformer on East 14th Street, plunging millions of residents living south of Midtown into darkness for days. “This stretch of river is the Achilles heel of Manhattan’s flood zone. Every inch of it was swallowed by water during the hurricane,” Stringer is set to say in the speech, which will be delivered at the Metropolitan Museum of Art. “What we have created here is a model that not only helps communities to re-imagine their waterfronts, but also helps to safeguard them at the same time,” he will say, according to his prepared remarks. To protect the transformer, Stringer will proposes building a new, green pedestrian bridge that would also serve as a flood wall, preventing water from inundating the plant. The plan also calls for shoring up the thin concrete bulkhead that now runs underneath the FDR with protective wetlands and new drainage to try to minimize a future surge. Similar wetlands would also be installed near Stuyvesant Cove — so “you’re fighting nature with mother nature," Stringer said ahead of the speech. 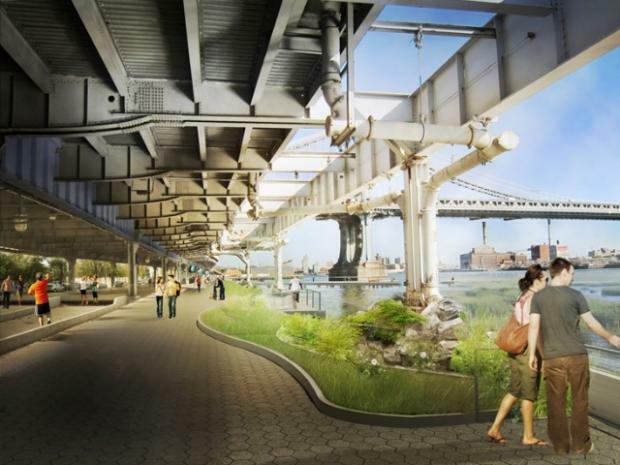 He'd also like to see the area beneath the Brooklyn Bridge be expanded to become “an active waterfront destination." Renderings of the plan released by Stringer's office show people playing with kayaks and swimming by the shore. ConEd spokesman Bob McGee said staff had been briefed on the plan, and would be working with Stringer's office in the coming months. “We’re familiar with the discussion around it, and we’re certainly encouraging of anything that would seek to make the waterfront more accessible for folks as well as to help protect our facilities,” he said. But, he noted the utility has already been working to shore up its facilities by raising them up and adding walls. The station at the East 14th Street station used to be 12 feet, six inches high and is in the process of being raised to 15 feet. “We’re taking steps now to protect our equipment,” he said. According to Stringer's office, the plan was developed in partnership with State Assemblyman Brian Kavanagh as well as local community boards and community-based groups, which have been working on it since 2010. Stringer’s office is allocating $3.5 million toward the effort, which will also be paid for with a grant from the New York State Department of State. His speech will also talk about the economy, raising concerns about the deficit, high unemployment and a struggling middle class. He called for new investments in the tech sector, and will announce plans for a conference for the mayoral contenders to discuss how to make that grow, he said.